Researchers at the University of Zurich‘s Artificial Intelligence Lab are laboring hard to deliver Roboy, an advanced humanoid robot. 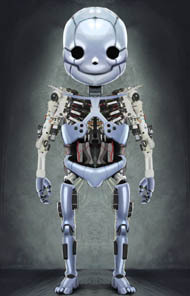 Roboy is nearing the third trimester of his 9-month gestation, and is expected to be delivered to the world March 8-9th, 2013 at the “Robots on Tour” exhibition in Zurich. Check out the promotional video below. Roboy, and its predecessor, Ecce, are “soft robots” — that is, robots with compliant joints, driven by stretchy tendons that may be safer and more forgiving when working with untrained people in an unstructured environment. Like Kenshiro, Ecce and Roboy are modeled after human anatomy. You can see a video of Ecce in action below. According to the press release, Roboy is designed to be a more advanced version of Ecce. Roboy’s a bit smaller, at 1.3 meters tall, and slightly less creepy. As can be seen in the video above, Ecce’s motions are not very controlled — there’s a lot of wiggle and wave, even in simple arm motions, compared to more traditional mechanics (like this Disney robot). I look forward to seeing how much that is improved in Roboy, and how well (if at all) Roboy will be able to walk. The AI Lab is using crowdfunding to help pay for Roboy’s development; you can donate to the project and in return, get your name or logo engraved somewhere on Roboy’s body. You can also friend Roboy on Facebook.